The Land of Little Rain. Boston and New York: Houghton, Mifflin and Company, 1903. 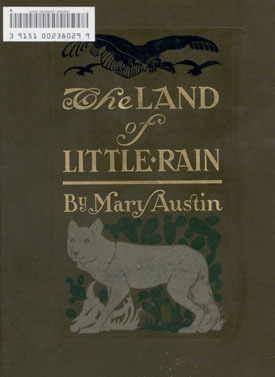 The Land of Little Rain, Mary Austin's first book, was a naturalist's look at the relationship between America's deserts and the Native Americans who inhabited them. It was a success, and Austin continued writing about the people and landscapes of western and southwestern America, calling for the preservation of natural areas and Native American culture.